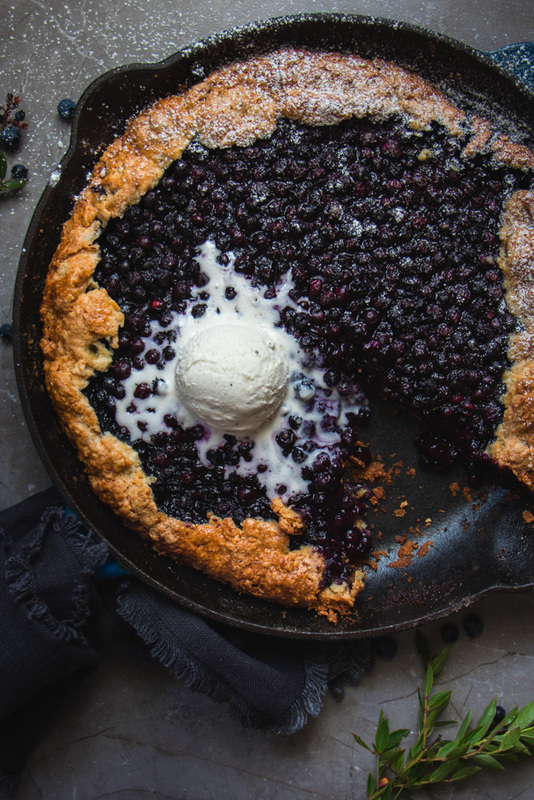 We’ve got a special recipe for you all today, a Wild Blueberry Biscuit Galette. It’s an attempt at making our Grandmother’s delicious blueberry grunt. It isn’t an exact replica, because it would seem all of her children have misplaced the recipe. But it’s a delicious dessert none-the-less. We decided to refrain from calling it a grunt, because it turns out Grandma Jean’s grunt was not made the traditional way. Most grunts are made with the berries underneath the biscuit dough; however, that’s not how mom remembers it being made. Apparently Grandma used to make it in a large roaster to feed all of her 17 kids, and the dough was always on the bottom, folded in along the edges to keep the berries tucked inside. Ours is definitely not made for feeding such a large crowd, but that’s okay because blueberries are expensive (or time consuming if picking your own). 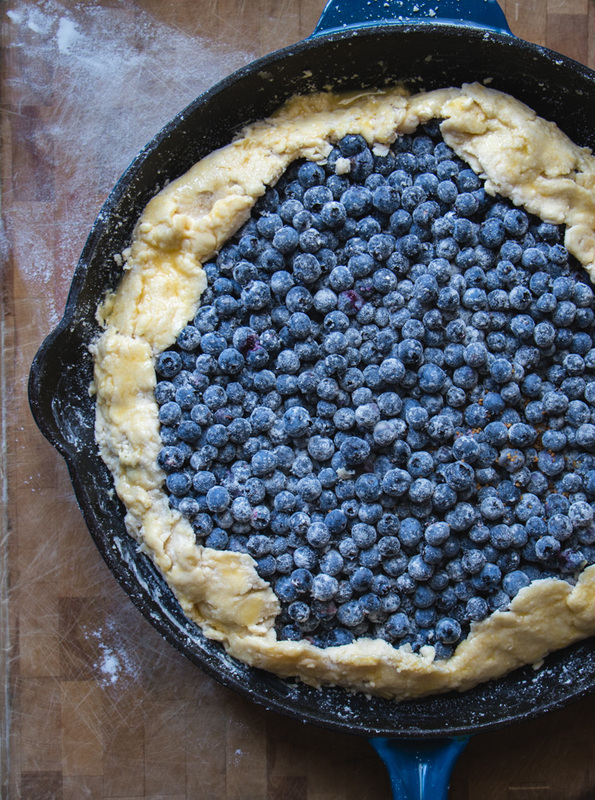 Thankfully, Dad was nice enough to provide us with the blueberries for our galette. 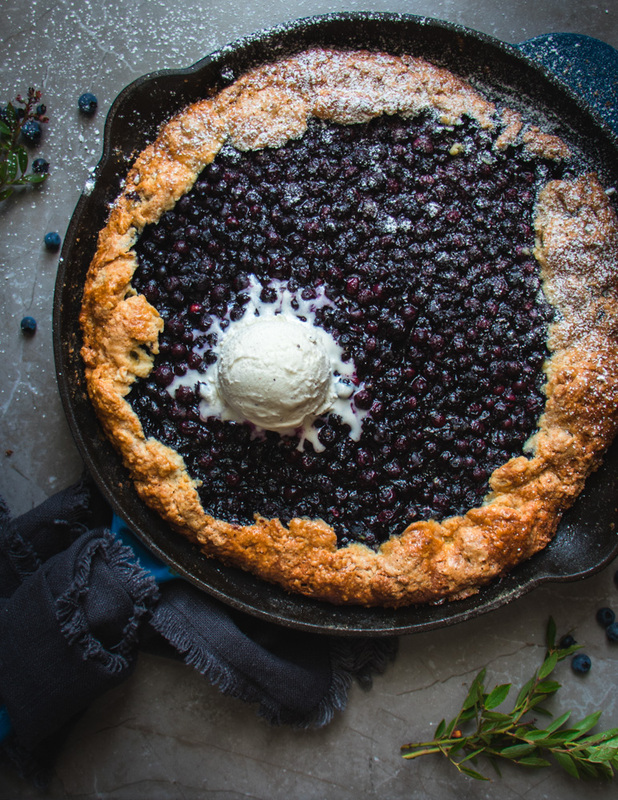 This wild blueberry galette isn’t made with a pie crust, but a sweet buttermilk biscuit crust, and it’s SO good. There’s no need to worry about it looking pretty, we’re going for the rustic look, which makes it somewhat fuss free. The dough is made the same way as for biscuits, but rolled out thinner. We used a large 12 inch cast iron pan to cook it in, but any glass dish that is large and deep enough would work fine. We also added only 1/4 cup sugar to the blueberries, and could have enough left it out entirely, the berries were that sweet. So our advice is to taste your berries and use your best judgement regarding sugar. 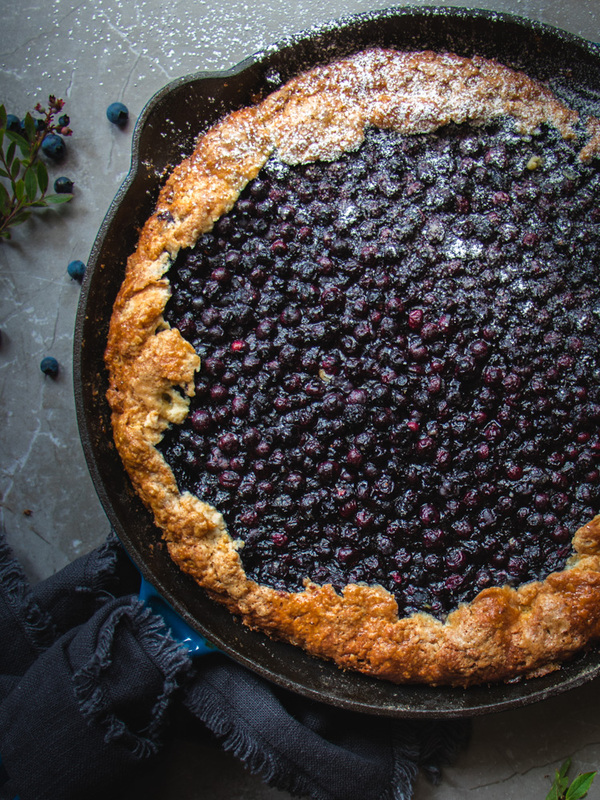 A sweet, crunchy biscuit crust, filled to the brim with fresh wild blueberries. A perfect end of summer treat. Preheat oven to 375F and grease a large 12 inch cast iron pan (or a large, deep glass dish) with butter. In a large bowl, mix together the flour, baking powder, baking soda, salt and 1/4 cup sugar. Using pastry blender or two knives, cut the butter into the flour mixture until you have small pea sized bits of butter and it's well mixed together. Place bowl in freezer, until ready to use. Whisk the buttermilk and 1 egg together in a separate bowl, set aside. 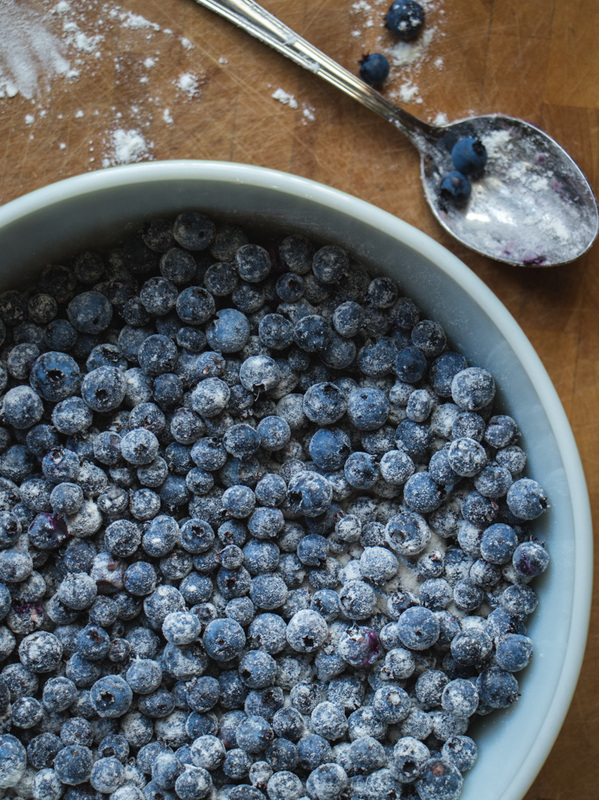 In another bowl, mix the blueberries with the flour and sugar, stir well to coat the berries. Remove flour/butter mixture from freezer, and add the wet ingredients, mixing gently with a fork until just combined. Form dough into a round disk and turn out onto a well floured surface. Pat the dough together and using a rolling pin, roll out into a 1/4 inch thick circle. Using your rolling pin, grab one side of the dough and gently roll it onto your rolling pin to transfer to the pan. Add the berry mixture to the center of the dough and carefully fold up the edges around the berries. Whisk an egg and brush the edges of the dough with the egg. Sprinkle egg wash with sugar, then transfer to the oven, cover with aluminum foil and bake for 1 hour. If the dough has not browned under the foil after 50 minutes, remove foil and bake uncovered for remaining 10 minutes. Let cool 15 minutes before serving with vanilla ice cream, if desired.